Jonathan Kimble Simmons (born January 9, 1955) is an American actor and voice actor. In television, he is perhaps best known for playing Dr. Emil Skoda on the NBC series Law & Order, Vernon Schillinger on the HBO series Oz and Assistant Police Chief Will Pope on TNT's The Closer. From 2017 to 2018, he starred as Howard Silk in the Starz series Counterpart. His film roles include J. Jonah Jameson in Sam Raimi's Spider-Man trilogy and music instructor Terence Fletcher in 2014's Whiplash. He is known for voicing Cave Johnson in the video game Portal 2 (2011), Tenzin in The Legend of Korra (2012–2014), Stanford Pines in Gravity Falls (2015–2016), Kai in Kung Fu Panda 3 (2016) and Mayor Lionheart in Zootopia (2016). He reprised his role as Jameson in various Marvel animated series and video games. He has also appeared in a series of commercials for Farmers Insurance and voices the Yellow M&M. Simmons's performance in Whiplash received widespread critical acclaim and earned him more than thirty accolades, including the Academy Award, Golden Globe Award and BAFTA Award for Best Supporting Actor. Simmons was born on January 9, 1955, in Grosse Pointe, Michigan, a suburb of Detroit, the son of Patricia (née Kimble), an administrator, and Donald William Simmons, a middle school music teacher. In 1965, when he was 10 years old, his family moved to Worthington, Ohio, a suburb of Columbus, Ohio. From 1970–1972, Simmons attended Thomas Worthington High School, where he participated in drama, football, and choir. In 1973, when he was 18, they moved to Missoula, Montana, where his father became director of the School of Music at the University of Montana. The younger Simmons graduated from the University of Montana in 1978 with a music degree. During his tenure, he was also part of the music-oriented fraternity Phi Mu Alpha Sinfonia. Later, Simmons moved to Seattle and became a member of the Seattle Repertory Theatre. He is known for his roles as Dr. Emil Skoda, a police psychiatrist who has appeared on three of the four incarnations of Law & Order and New York Undercover, and as sadistic neo-Nazi inmate Vernon Schillinger on the prison drama Oz. He also stars as Ralph Earnhardt, the father of race-car driver Dale Earnhardt, in 3: The Dale Earnhardt Story. 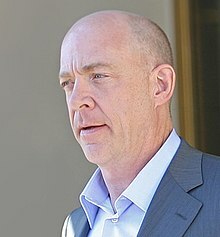 He plays Will Pope, Assistant Chief of the LAPD, in the series The Closer. In the show Raising Hope, he plays Burt Chance's brother Bruce Chance. In a precursor to joining the Law & Order cast as Skoda, Simmons appeared in Homicide: Life on the Street, portraying a criminal in a Law & Order cross-over episode. Other roles include that of an army general in the television sitcom Arrested Development, and Dan the Barber in the surreal Nickelodeon series The Adventures of Pete & Pete in 1995. He played B.R. in the film Thank You for Smoking (2005) and has been praised for his performance in Juno (2007) as "Mac" McGuff, the title character's father. In all three of Sam Raimi's Spider-Man films, Simmons played J. Jonah Jameson, editor-in-chief of the newspaper Daily Bugle (as well as in the expanded video game adaptation of Spider-Man 3). In 2008, he played a CIA superior in Burn After Reading and appeared in Postal as Candidate Welles. He also appeared in I Love You, Man as the father of Paul Rudd's character. Simmons starred in several films produced or directed by his friend Jason Reitman, including Thank You for Smoking, Juno, Up in the Air, and Jennifer's Body. In 2013, he had a small role as Mr. Jervis in Reitman's film Labor Day. He voices Tenzin, an Airbending master and the son of Aang and Katara, in the 2012 Nickelodeon series The Legend of Korra. He starred as blind lawyer "Mel Fisher" in Growing Up Fisher. From 2015 to 2016, he voiced the scientist Stanford Pines on the Disney XD cartoon series Gravity Falls. In the 2014 drama film Whiplash, Simmons played Terence Fletcher, an intensely demanding conductor at the fictional Shaffer Conservatory of Music, who bullies and cajoles his student, Andrew Neiman (Miles Teller). The wide acclaim for Simmons's performance included an Academy Award win for Best Supporting Actor. Rolling Stone said "Beat the drums for an Oscar for Simmons." Richard Roeper of the Chicago Sun-Times said "Simmons delivers one of the most memorable performances of the year." Entertainment Weekly summed up the reaction by saying Simmons's performance "has been universally praised" and that he was "a leading contender for Best Supporting Actor." On January 11, 2015, Simmons won the Golden Globe Award for Best Supporting Actor – Motion Picture and the Academy Award for Best Supporting Actor on February 22, 2015. In January 2015, Simmons was cast in a leading role in the film Kong: Skull Island, though he and Michael Keaton later exited the film. Simmons performed a substantial number of voice-over roles alongside his live action work. Several of these have arisen from his J. Jonah Jameson character in Raimi's Spider-Man films, including voices of two newspaper editors in episodes of the eighteenth season of The Simpsons. While unnamed, these characters are clearly meant to emulate Jameson (one, bearing Jameson's appearance, demands "pictures of Spider-Man," then one being reminded he works at a poetry journal, and so demands "poems about Spider-Man"). [original research?] Likewise, Simmons voiced an editor-in-chief of a newspaper (with Jameson's appearance and mannerisms) for a 2013 episode of The Hub's Pound Puppies. In 2016, Simmons lent his voice to two animated films, voicing the antagonist Kai in Kung Fu Panda 3 and Mayor Lionheart in Zootopia. Worlds Apart is a 2015 Greek drama film directed by Christoforos Papakaliatis. Worlds Apart consists of three separate narratives, each following a love story between a foreigner and a Greek. Each story represents a different generation falling in love during a time of socioeconomic turmoil that dominates Southern Europe as a whole, only to connect as a single story in the end. Simmons stars as Sebastian. Simmons reprised his role as the voice of J. Jonah Jameson in the animated series Ultimate Spider-Man, The Avengers: Earth's Mightiest Heroes, and Avengers Assemble. He has also expressed interest in reprising the role in Sony and Marvel Studios' reboot of the Spider-Man film series, Spider-Man: Homecoming, released in 2017. In friend Reitman's film Young Adult, he voiced the protagonist's boss, via a series of voicemails. He also provided the voice of General Wade Eiling in Justice League Unlimited. He recorded an audiobook for Tom Clancy's Net Force: Point of Impact. In 2017, Simmons portrayed Commissioner James Gordon in Zack Snyder's film Justice League, part of the DC Extended Universe. He is set to reprise the role in Matt Reeves's stand-alone Ben Affleck Batman film The Batman. In the field of television commercials, Simmons is wildly known for being the voice of the yellow M&M, a role he has played since 1996, replacing John Goodman. He has also done voice-over work for Norelco razors. In live-action, he is featured as Professor Nathaniel Burke of the University of Farmers in ads for Farmers Insurance Group, since 2010. Simmons is an avid fan of the Detroit Tigers. He threw the ceremonial first pitch for the Tigers on April 6, 2015, for Opening Day. He played the Tigers' manager in For Love of the Game (1999). Simmons is also a fan of the Ohio State Buckeyes, having spent his formative years in Ohio. Simmons is a member of Phi Mu Alpha Sinfonia, the men's music fraternity, and was initiated in 1975 at University of Montana. During Mardi Gras 2018, J.K. Simmons was awarded King of Bacchus by the Krewe of Bacchus. ^ "J.K. Simmons". TVGuide.com. Retrieved March 27, 2015. ^ "J. K. Simmons Biography". Filmreference.comm. Retrieved November 24, 2017. ^ "Jonathan Kimble ("J. K.") Simmons". Rootsweb.comm. Retrieved November 24, 2017. ^ "Patricia 'Pat' Kimble Simmons". Missoulian.comm. Retrieved November 24, 2017. ^ "J. K. Simmons Yearbook". Retrieved March 5, 2018. 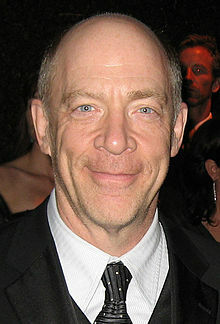 ^ a b c "J. K. Simmons Biography". Yahoo! Moviesm. Retrieved November 24, 2017. ^ "Wichita Eagle: Search Results". Newsbank.comm. Retrieved November 24, 2017. ^ "J. K. Simmons". Playbillvault.com. Retrieved November 24, 2017. ^ Stanley, Alessandra (February 21, 2014). "The Fun of Having a Single Parent". The New York Times. Retrieved April 26, 2014. ^ "Whiplash". Metacritic.com. Retrieved November 24, 2017. ^ "J.K. Simmons: The friendly face behind this year's scariest movie villain". Insidemovies.ew.com. Retrieved November 24, 2017. ^ "J.K. Simmons Wins Golden Globe for 'Whiplash' Role". Bloomberg.com. January 12, 2015. Retrieved November 24, 2017. ^ McNary, Dave (February 22, 2015). "J.K. Simmons Wins Oscar for Best Supporting Actor". Variety. Retrieved February 22, 2015. ^ "J.K. Simmons Reveals Kong: Skull Island Details; Keaton All But Confirms Involvement – Dread Central". www.dreadcentral.com. Retrieved November 24, 2017. ^ Jaafar, Ali (July 1, 2015). "Michael Keaton And JK Simmons Exit Legendary's 'Kong: Skull Island'". Deadline. Retrieved November 24, 2017. ^ VanMetre, Elizabeth (February 28, 2016). "EXCLUSIVE: J.K. Simmons Reacts to 'Spider-Man' Petition Calling for His Return: 'I'll Never Close the Door on Anything'". Entertainment Tonight. Archived from the original on March 2, 2016. Retrieved March 2, 2016. ^ a b "Ben Affleck and J. K. Simmons on the Solo Batman film (UPDATE)". Comingsoon.net. September 30, 2016. Retrieved October 6, 2016. ^ "'Justice League' Adds J.K. Simmons as Commissioner Gordon (Exclusive)". The Hollywood Reporter. Retrieved November 24, 2017. ^ "7 Actors Who Voiced M&Ms". mentalfloss.com. February 27, 2015. Retrieved January 26, 2019. ^ Red Alert Universe > Factions > Factions, Units, & Characters Archived July 24, 2009, at the Wayback Machine, President Ackerman character information. ^ Miller, Greg (March 11, 2011). "PAX: Portal 2 Nabs J.K. Simmons". IGN. Retrieved March 14, 2011. ^ "Edge Online – Video game features, reviews & industry jobs". Edge Online. Archived from the original on August 29, 2011. ^ Porter, Rick (February 23, 2015). "J.K. Simmons' wife, Michelle Schumacher, is the star of his 2015 Oscars speech". Zap2it. Retrieved March 27, 2015. ^ Tony Paul, The Detroit News (March 26, 2015). "Actor J.K. Simmons to throw out first pitch Opening Day". Detroit News. Retrieved March 27, 2015. ^ Nolan, Katie (October 20, 2016). "Interview with J.K. Simmons". Garbage Time with Katie Nolan. Fox Sports 1. Retrieved November 24, 2017.